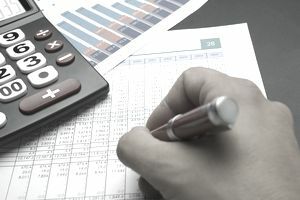 Retained earnings represent a business firm's cumulative earnings since its inception, that it has not paid out as dividends to common shareholders. Retained earnings instead get plowed back into the firm for growth and use as part of the firm's capital structure. Companies typically calculate the opportunity cost of retaining these earnings by averaging the results of three separate calculations. Retained earnings belong to the shareholders since they're effectively owners of the company. If put back into the company, the retained earnings serve as a further investment in the firm on behalf of the shareholders. The cost of those retained earnings equals the return shareholders should expect on their investment. It is called an opportunity cost because the shareholders sacrifice an opportunity to invest that money for a return elsewhere and instead allow the firm to build capital. Companies have four possible direct sources of capital for a business firm. They consist of retained earnings, debt capital, preferred stock, and new common stock. Estimating the cost of retained earnings requires a bit more work than calculating the cost of debt or the cost of preferred stock. Debt and preferred stock are contractual obligations, making their costs easy to determine. Three common methods exist to approximate the opportunity cost of retained earnings. Investors who buy stocks expect to receive two types of returns from those stocks—dividends and capital gains. Firms pay out profits in the form of dividends to their investors quarterly. Capital gains, usually the preferred return for most investors, consist of the difference between what investors pay for a stock and the price for which they can sell it. From those variables, you can calculate the cost of retained earnings using the discounted cash flow method. To do so, use the price of the stock, the dividend paid by the stock, and the capital gain, also called the growth rate of the dividends, paid by the stock. The growth rate equates to the average, year-to-year growth of the dividend amount. With these inputs, you can calculate the cost of retained earnings with the following formula. This method is also known as the "dividend yield plus growth" method. Cost of Retained Earnings = ($1.08 / $30) + 0.08 = .116, or 11.6 percent. The Risk-Free Rate Currently in the Economy: The return you would expect on investment with zero risks. You can use the rate on a 3-month U.S. Treasury bill. The Return on the Market: What you expect from the market as a whole. To determine this return, use the return on a market index such as the Wilshire 5000 or the Standard and Poor's 500. The Stock's Beta: This measurement represents a stock's risk, with 1.0 representing the beta of the market as a whole. A stock 10 percent riskier than the market would have a beta of 1.1, for example. Safer stocks will have betas of less than 1.0. Many investment sites such as Bloomberg calculate and list betas for stocks. It gives you a cost of retained earnings of 11 percent. This simple method of calculating the cost can provide a "quick and dirty" estimate. Take the interest rate on the firm's bonds and add on a risk premium. The risk premium would usually range from 3 to 5 percent, based on a judgment of the firm's riskiness. For example, if the bond's interest rate is 6 percent and you assign a risk premium of 4 percent, add these together to get an estimate of 10 percent. Any of the three methods can provide an approximation of the cost of retained earnings. To get a useful result that factors in the most information, calculate all three methods and use their average. The examples provided resulted in answers of 11.6 percent, 11 percent, and 10 percent. Those three figures average out to 10.86 percent. That would be a useful approximation of the cost of retained earnings for a firm with the figures provided in the examples.